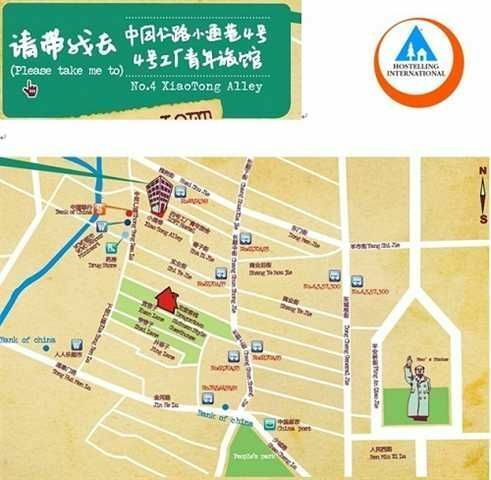 Very Very Very good location, we are in the center of Chengdu near the most famous Peoples Park, and AAAA National Protect Scenic Spot of Chengdu-KUAN LANE. 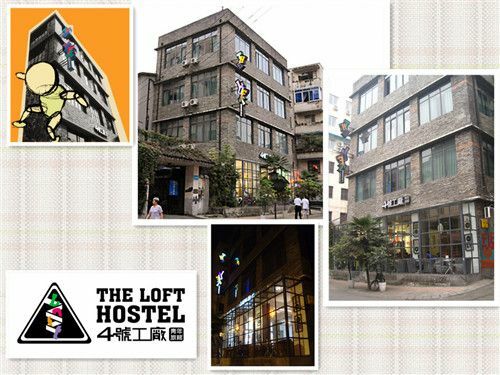 It is very easy to getting around Chengdu by any public transportation from the LOFT.The 1st and ONLY hostel in Chengdu designed by local artist. The building itself was a former printing factory went bankrupt in 1990s, till 2005 a group of local artist found this building and spent almost 7 months to turn this factory into a super cool hostel, a home away from home for backpackers. 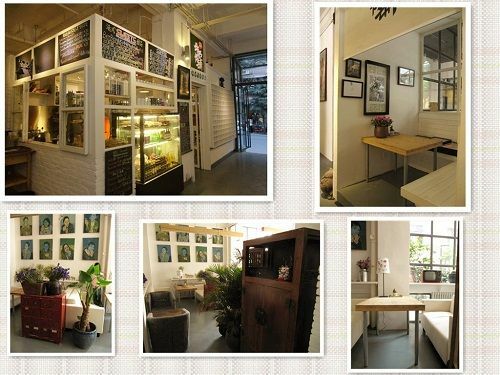 If you want to know more about Chengdus art life and underground music, if you want to stay in a hostel with a unique style. Im sure LOFT will the right choice.This means a lot how central we are3 minutes walk to AAAA National Kuan Lane Scenic Spot6 minutes walk to the most famous Peoples Park 8 minutes walk to the Chengdu Catholic Church15 minutes walk to the central TianFu Square15 minutes walk to central Muslim MosqueMETRO Station Line 2 Tong Hui Men Station is 350 metres awayBUS 48 from ChangShun Jie to XinNanMen Bus Station is 200 metres awayBUS 64 from Jin He Road to LiangJiaXiang North Gate Bus Station is 250 metresBUS 341 from Huai Shu Jie to ChaDianZi Bus Station is 200 metres awayBUS 54 from Huai Shu Jie to North Railway Bus Station is 200 metres awaySomething about the LOFTThe 1st FLOOR reception & milk book-storeReception We offer 24/HOUR check in service, so please dont worry about arriving late.We do speak English in order to have no more communication problems. The Smart Travel Solution/ a well experienced Travel Agency is ready to helpyou with your travel plans.The Milk Book-Store Caf The Caf is not only a book-store where you can find thousands of English books but also an art gallery where you can find Chengdu local art works & DECO, besides that our barista knows how to make a real good coffee from a simple espresso. we offer the latest information about fine art exhibitions in and around Chengdu.IS this what you are looking for in Chengdu?Comfortable beds? Clean rooms & towels? No communication problems? FREE Professional Travel Advise? Smooth Hot water when showing? Cheap local tours? A spot to meet other travelers? Functional Free WIFI access? FACE BOOK & twit ? Soft sofa in lounge room?Besides all of these, we offerFree Movie room with hundreds of DVDs-latestFree Luggage Storage for 1 month Free Lockers in roomFree English pocket map of ChengduP.SWhy the water is so smooth when taking shower cause the daily water has been demineralized. Also the drinking water has been purified and even the air in the lobby & Caf has been purified in our hostel, we apologize for the fast development in China, it does cause side problems, no worries for the PM2.5 problems while your are in you home in Chengdu.Who runs the LOFT: Smart Travel Solution since 1997We start our first Travel Agency in Traffic Hotel in 1997, we are specialized of working with individual budget backpackers over 16 years, from discount flight tickets booking to ICE-BERG climbing, we know exactly backpackers needs. Over 16 years word of mouth, we had been highly recommended by a great number of guide books and magazines.We have co-operation with a lot of local out door clubs in town, you can get the newest information about the local outdoor events from us. We dont only run hostels, we are licensed travel agent as well. We offer special TIBET Budget Tours and Panda Breeding Center Tours, or our highlight Smart Travel Solutions special Panda volunteer 3 days working Tours. As you are a guest of Chengdu, we have prepared a few FREE tours that you might be interested with which you cant find nowhere else.Monday FREE TAICHI Class Tuesday FREE CITY Bike TourWednesday FREE CITY walking TourThursday FREE Countryside Bike TourFRIDAY FREE MaJong Class & dumpling part at night(All of these tours must be sign up 1 day before)TIBET BUDGET TOURSWe specialize in arranging the Tibet permit for 16 years (Lonely Planet mentioned us in Tibet Guidebook 7th Edition on the page 91), we work with our sister hostel Loft Design Hostel and Nova Travelers Lodge to find you more travelers to share the cost to Tibet! (Since we have about 400 beds in Dragotown Hostel, Loft hostel and Nova Hostel its always very easy to find people to share the cost! )LOCAL ToursTAICHI Class Teaching BY GOLD MEDAL WINNERPanda Breeding Center Half Day TourPanda Breeding Center 1 DAY Volunteer WorksPanda Breeding Center 3 Day Panda Partake-Care Experiences Face Changing Show & Rolling LightsSICHUAN Cuisine teaching ClassTours out of townNATIONAL PARK Jiu Zhai Gou 3~4 Day TourGiant Buddha & Mt.Emei 2 Day TourMt. SiGuNiang 6 Day Tour Hai Luo Gou Glacier Park 4 Day TourDiscount Tickets for Yangtse River CruiserWe promise you that we have the best tours and best value.24 Hours checkingCheck OUT Time 1:00 PMWhilst you are visiting, our home is your home.